The Pieni Unikko Mini Umbrella is adorned with one of the most popular patterns by the Finnish manufacturer. The flower pattern will put you in a good mood, even on grey rainy days, making it perfect for an umbrella. The umbrella is easily folded away and fits perfectly in the bag thanks to its compact size. A cover is also included. Pieni Unikko is a smaller version of the famous Unikko pattern, which was designed by Maika Isola for Marimekko in 1964. To create Pieni Unikko (literally: "small poppy"), Kristina Isola, daughter of the Finnish design icon, used the floral pattern on a smaller scale. This ensures that the floral print can be fully appreciated on the umbrella. 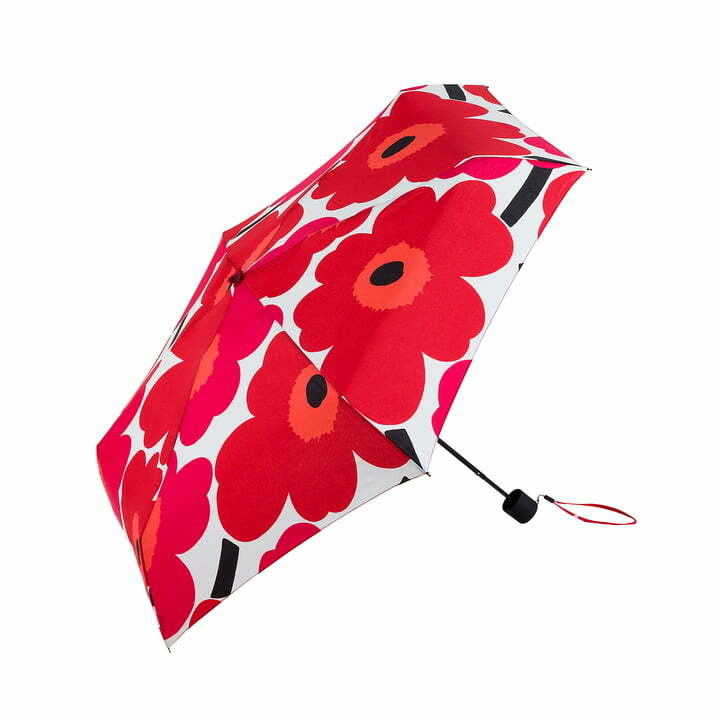 Isolated product image of the Pieni Unikko Mini Umbrella by Marimekko in red. The compact umbrella is adorned with the iconic floral design by Maija Isola.